Dusty Holcombe, deputy director of the Virginia Office of P3s, gave welcoming remarks. 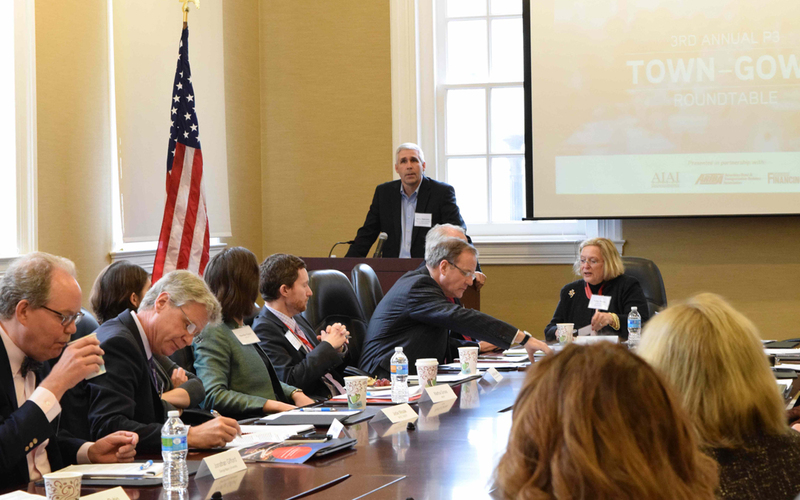 Nearly 40 practitioners, public officials and academics in the public private partnerships (P3) sector met Jan. 12 at the ARTBA Building for a half-day roundtable discussion. Public Works Financing, the respected journal of P3 market and policy activities, launched the annual event in 2014, holding it at ARTBA’s Washington, D.C. headquarters on each occasion. Sallye Perrin of WSP Parsons Brinckerhoff moderated this year’s discussion on behalf of the Association for the Improvement of American Infrastructure. Topics included providing transparency and building support for P3 projects, optimal size for P3 projects, P3s in transit, innovation and procurement challenges. ARTBA staff made a presentation on P3-related provisions in the recent FAST Act. Dusty Holcombe, deputy director of the Virginia Office of P3s and current president of ARTBA’s P3 Division, gave welcoming remarks. For more information on ARTBA’s P3 Division activities, contact Rich Juliano.